There exists a small but vocal contingent of the adult fan community who look down upon Bionicle and its descendent Hero Factory, claiming that the pieces are juvenile, not useful, and altogether too different to mix with traditional bricks. I’ve never understood this train of thought. LEGO is about imagination, and the ability to successfully incorporate unusual elements into a model is generally viewed as positive. Besides, there are just so many cool things that can be done with Bionicle pieces, completely aside from building large poseable action figures. Take, for instance, this wicked cool spaceship by Ricardo Soà. Incorporating both traditional bricks and pieces of Bionicle heritage, it’s menacing and awesome in a way that is fresh and new. It’s a welcome change of pace for a community which frequently sees the same styles again and again. 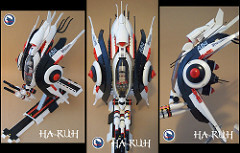 And since we’ve not featured Ricardo here before, it’s worth taking a peek at some of his other killer spacecraft. SMALL, but vocal? Not being one of them (having built bionicle MOCs myself a few years ago), but there are a LOT of AFOLs who dislike bionicle. Maybe not on the main sites, but my LUG is filled with such. I think that if you take the LEGO community as a whole, people who outright dislike Bionicle and refuse to use it are a minority. Of course, I don’t have any solid numbers, and I freely admit I’m probably being optimistic. 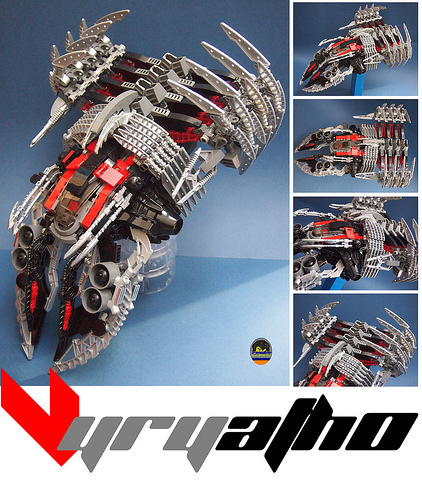 I can’t say I’ve seen many builders that claim to dislike Bionicle, but it does make sense that there would be people who think the large, overly specific pieces take away from the “creativity” of LEGO building. 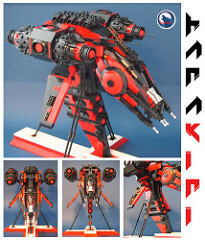 I for one believe that using BIONICLE elements can show one’s talent as a builder – if you can incorporate a BIONICLE piece into a System MOC, it can look quite impressive. There’s a wide spectrum of opinions on BIONICLE I’ve seen in the AFOL community. I haven’t seen a lot of vitriol targeted at builders who use BIONICLE pieces, or even at BIONICLE MOCists. But I feel like a lot of AFOLs tend to think of it similarly to themes like Galidor: “I admire people who find ways to use it creatively, but the sets and the parts themselves are still badly-designed garbage”. Personally, I’ve been a fan of constraction themes in general since Throwbots/Slizer, and am still a real Hero Factory fan. So obviously these opinions bother me quite a bit. I’m glad TBB doesn’t harbor those kinds of pretentions and features both “fusion” MOCs like this that combine constraction with system and more purely constraction-based MOCs like this one. After all, constraction building has its own merits, and while it’s great to appreciate what such parts can add to System creations, that’s hardly the be-all and end-all of their creative potential.